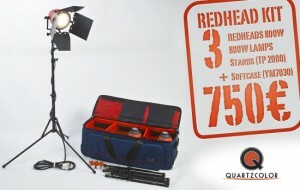 QuartzColor (France) is introducing a new portable continuous lighting kit for use on location. For €750 you get three Redhead floodlights (including lamps), three 5-section reflex light stands (Nano-style) and a case in which to carry it all. 15,000 is the quantity of RedHeads sold by QUARTZCOLOR during the last three years since QUARTZCOLOR joined the GROUPE FOKIA. To celebrate this success, QUARTZCOLOR is proud to launch its new DOLCEVITA REDHEAD KIT. Self coloured heat resistant fiber glass construction making it the only safe and unbreakable openface fixture on the market. Complete accessory range available including the well-known Quartzcolor accessory holder. Unique large rear focusing knob & carriage system for perfect light control. 3x Redheads 800W Head fitted w/ On/Off in-line toggle switch 10A/250V, 4m length cable with connector, manual “U”-shape stirrup w/ single lock-off knob and integrated 16mm (5/8″) socket. Supplied w/ rotating barndoor adapter w/ wire mesh safety guard 3 x 3mm + 4-leaf barndoor Ø164mm. 3x Compact Light Stands 5 sections, 4 risers, column tubes Ø25/22/18/12mm, max. extension 195cm, min. working height 50cm, closed length 48cm, footprint Ø100cm, weight 0,75kg, max. load 1,9kg, aluminium, black, w/ 16mm (5/8″) spigot, no optional wheels available. 1x Rolling Softcase for Lights & Stands for 3x RedHeads + 3x stands + all required accessories. The sleek modern design and the use of the self coloured heat resistant reinforced fibreglass moulding compound give the QuartzColor Redhead the light-weight and durability which make it an ideal unit for portable lighting use. Its easy handling and wide variable beam make it a favourite among cameramen in the video, television and film industry. Available in a single unit or in various kits of 3- or 4-head configurations. Also available in black.